Thanks for praying for my Hebrew exam. It was okay - tough, but fair. I think I'll pass - but I'm not sure. Four years ago, I thought I passed, and failed by 1 1/2 marks - got 48.5. That was really frustrating. So we'll wait & see. Nov 2004, Moore Hebrew 1A final: stressed because I was learning both Greek and Hebrew from scratch at the same time. Bad idea. Result: failed Hebrew by 1 1/2 marks (*grumble*) (passed Greek okay). Jan 2005, Moore Hebrew 1A re-sit: came down with CHICKEN POX! Failed again. Nov 2007, Moore Hebrew 1A again: had just handed in my 30,000-word project. 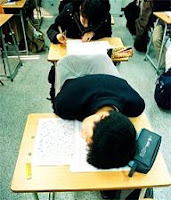 Fell asleep in the exam. Failed again. Nov 2008, PTC Hebrew B: stressed because of uncertainty about ministry next year. Came down with head cold. Result: ??? I'm not big on guidance, but d'you think God's trying to tell me something...?